AIXM 5 takes advantage of existing and emerging information engineering standards and supports current and future aeronautical information system requirements. The major tenets are - An exhaustive temporality model describing when features are valid and how feature properties change over time. 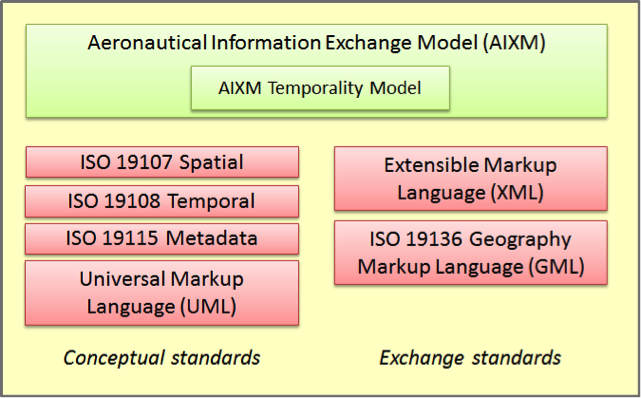 The Temporality model also covers modeling the temporary information contained in NOTAMs (Notice to Airmen), - Alignment with ISO standards for geospatial information including the use of the Geography Markup Language (GML 3.2), - Support for the latest ICAO and user requirements for aeronautical data including obstacles, terminal procedures and airport mapping databases, - Modularity and extensibility to support current and future aeronautical information messaging requirements and additional data attributing requirements. The OGC Catalog Service supports the ability to publish and search collections of descriptive information (metadata) for data, services, and related information objects. Metadata in catalogs represent resource characteristics that can be queried and presented for evaluation and further processing by both humans and software. The Catalog Service supports the discovery and binding to these registered information resources within an information community. Apparently there are no functional changes in v2.0, only additions (e.g. more scenarios); the XML Schema schema is the same, eventually with the exception of one additional attribute; the rules for the DNOTAM scenarios remain roughly the same. Note: a draft version of the specification is available as a set of working copies at https://drive.google.com/folderview?id=0BxlGN-YBj-q0dnFpMzBTUFBoM3c&usp=sharing – which can be used for RFQ evaluation and response development. Note: this reference shall only be used for RFQ evaluation and response development. The successor – version 2.0 – will be the official DNOTAM specification to use in OWS-10. The Digital NOTAM Event Specification defines the rules for harmonised encoding as AIXM data sets (version 5.1 or later) of the information currently published through NOTAM messages. The document is intended primarily to system developers, as most of these rules will have to be translated into computer code that results in database structures, human-machine interfaces, data validation rules, etc. However, the document is developed with significant input from operational experts, in order to capture all the rules and requirements that will guarantee safe, efficient and reliable Digital NOTAM operations. The main goal of the document is to enable the interoperability of the different systems that produce, transform, transmit and consume Digital NOTAM data, as part of the digital aeronautical information is general. The application of common rules is also expected to reduce the cost of the implementations because it minimizes the need for mapping and adaptation of the data coming from different sources. The Event Service realizes an interface that supports subscription for relevant information published by a service within the architecture. Various ways exist to define filter criteria that separate relevant from irrelevant information. Relevant information is sent by the Event Service to the subscription consumer as soon as possible, in a push-based manner. The Event Service thus is a key component to support the publish-subscribe message exchange pattern. It is implemented based upon the OASIS Web Services Notification standard which leverages W3C standards (such as WS-Addressing and usually also SOAP). The Flight Information Exchange Model (FIXM) is an exchange model capturing Flight and Flow information that is globally standardized. FIXM is the equivalent, for the Flight domain, of AIXM (Aeronautical Information Exchange Model) and WXXM (Weather Information Exchange Model), both of which were developed in order to achieve global interoperability for, respectively, AIS and MET information exchange. FIXM is therefore part of a family of technology independent, harmonized and interoperable information exchange models designed to cover the information needs of Air Traffic Management. The OGC Filter Encoding Implementation Specification describes an XML encoding of the OGC Common Catalog Query Language (CQL) as a system neutral representation of a query predicate. The filter encoding is a common component used by a number of OGC Web Services (e.g. WFS) requiring the ability to query objects from a web-accessible repository. GML is an XML grammar for expressing geographical features. It serves as a modeling language for geographic systems as well as an open interchange format for geographic transactions on the Internet. It allows users and developers to describe generic geographic data sets that contain points, lines and polygons. However, the developers of GML envision communities working to define community-specific application schemas as described on Wikipedia that are specialized extensions of GML. Using application schemas, users can refer to roads, highways, and bridges instead of points, lines and polygons. If everyone in a community agrees to use the same schemas they can exchange data easily and be sure that a road is still a road when they view it. Clients and servers with interfaces that implement WFS read and write GML data. GML is also an ISO standard (ISO 19136:2007). See also the GML pages on OGC Network. This specification defines GeoPackage files for exchange and GeoPackage SQLite Extensions for direct use of vector geospatial features and/or tile matrix sets of raster maps at various scales. Direct use means the ability to access and update data in a “native” format without intermediate format translations. A GeoPackage file is a platform-independent SQLite database file that contains GeoPackage data and metadata. A Geosynchronization service, deployed by a data provider, sits between the provider's data store(s) and data collectors. It allows data collectors to submit new data or make modifications to existing data without directly affecting the data in the provider's data store(s) until validation has been applied thus ensuring that the data published by the provider is of high quality. This application schema specifies a GML coverage model extending the definition of GML 3.2.1 in a compatible way. This enhanced coverage model is used, for example, by the Web Coverage Service (WCS) Standard version 2.0 and higher, but is independent from the WCS service. The Geography Markup Language (GML) is an XML encoding for the transport and storage of geographic information, including both the geometry and properties of geographic features. AIXM, for example, is based on GML. The OGC Aviation DWG has developed an AIXM 5.1 GML profile. The community acknowledged the need for such a profile because the ISO 19107 spatial schema (implemented by GML) is complex, and contains an extensive list of geometries, geometric properties and operations – many of which are not necessary for aeronautical information applications. In addition, the ISO 19107 contains a complicated 3D geometry model that is not suitable for AIXM either. The GML profile and guidance for AIXM identifies a selection of GML features that all AIXM implementers need to eventually support. KML is an XML language focused on geographic visualization, including annotation of maps and images. Geographic visualization includes not only the presentation of graphical data on the globe, but also the control of the user's navigation in the sense of where to go and where to look. From this perspective, KML is complementary to most of the key existing OGC standards including GML (Geography Markup Language), WFS (Web Feature Service) and WMS (Web Map Service). Currently, KML 2.2 utilizes certain geometry elements derived from GML 2.1.2. These elements include point, line string, linear ring, and polygon. NIEM is the National Information Exchange Model. This is an interagency initiative to provide the foundation and building blocks for national-level interoperable information sharing and data exchange. The NIEM project was initiated on 28 February 2005 as a joint venture between the U.S. Department of Homeland Security (DHS) and the U.S. Department of Justice (DOJ) with outreach to other Government departments and agencies. The NIEM leverages both the Global Justice XML Data Model (GJXDM) reference model and the GJXDM XML-based framework and support infrastructure. The OGC Web Services Context Document (OWS Context) was created to allow a set of configured information resources (service set) to be passed between applications primarily as a collection of services. OWS Context is developed to support in-line content as well. The goal is to support use cases such as the distribution of search results, the exchange of a set of resources such as OGC Web Feature Service (WFS), Web Map Service (WMS), Web Map Tile Service (WMTS), Web Coverage Service (WCS) and others in a ‘common operating picture’. Additionally OWS Context can deliver a set of configured processing services (Web Processing Service (WPS)) parameters to allow the processing to be reproduced on different nodes. The Styled Layer Descriptor (SLD) Profile of the OGC Web Map Service (WMS) defines an encoding that extends the WMS standard to allow user-defined symbolization and coloring of geographic feature and coverage data. A service implementing this profile is called a Feature Portrayal Service (FPS). SLD addresses the need for users and software to be able to control the visual portrayal of the geospatial data. The ability to define styling rules requires a styling language that the client and server can both understand. The OGC Symbology Encoding Standard (SE) provides this language, while the SLD profile of WMS enables application of SE to WMS layers using extensions of WMS operations. Additionally, SLD defines an operation for standardized access to legend symbols. Note: the difference between styles and symbols is as follows: styles, encoded using OGC Symbology Encoding (SE), describe styling attributes that can be applied to particular features in the portrayal process. Symbols are generic graphical entities referenced in styles and used by the FPS during the styling process. SQLite is a in-process library that implements a self-contained, server less, zero-configuration, transactional SQL database engine. The code for SQLite is in the public domain and is thus free for use for any purpose, commercial or private. SQLite is currently found in more applications than we can count, including several high-profile projects. SQLite is an embedded SQL database engine. Unlike most other SQL databases, SQLite does not have a separate server process. SQLite reads and writes directly to ordinary disk files. A complete SQL database with multiple tables, indices, triggers, and views, is contained in a single disk file. The database file format is cross-platform - you can freely copy a database between 32-bit and 64-bit systems or between big-endian and little-endian architectures. These features make SQLite a popular choice as an Application File Format. Think of SQLite not as a replacement for Oracle but as a replacement for fopen() SQLite is a compact library. With all features enabled, the library size can be less than 350KiB, depending on the target platform and compiler optimization settings. (64-bit code is larger. And some compiler optimizations such as aggressive function inlining and loop unrolling can cause the object code to be much larger.) If optional features are omitted, the size of the SQLite library can be reduced below 200KiB. SQLite can also be made to run in minimal stack space (4KiB) and very little heap (100KiB), making SQLite a popular database engine choice on memory constrained gadgets such as cellphones, PDAs, and MP3 players. There is a tradeoff between memory usage and speed. SQLite generally runs faster the more memory you give it. Nevertheless, performance is usually quite good even in low-memory environments. TestNG is a testing framework inspired from JUnit and NUnit but introducing some new functionality that makes it more powerful and easier to use, such as: - Annotations. - Run your tests in arbitrarily big thread pools with various policies available (all methods in their own thread, one thread per test class, etc...). - Test that your code is multithread safe. - Flexible test configuration. - Support for data-driven testing (with @DataProvider). - Support for parameters. - Powerful execution model (no more TestSuite). - Supported by a variety of tools and plug-ins (Eclipse, IDEA, Maven, etc...). - Embeds BeanShell for further flexibility. - Default JDK functions for runtime and logging (no dependencies). - Dependent methods for application server testing. TestNG is designed to cover all categories of tests: unit, functional, end-to-end, integration, etc. The TICM is a formal representation of the requirements for terrain data described in the International Civil Aviation Organization’s (ICAO’s) Annex 15 and is expressed as a collection of Unified Modeling Language (UML) diagrams. The TIXM is an Extensible Mark-up Language (XML) Schema implementation of the TICM, and thereby constitutes an exchange format for terrain data. The geospatial aspects of TIXM are implemented using Geography Mark-up Language (GML) version 3.2. The OGC Web Coverage Service (WCS) supports electronic retrieval of geospatial data as "coverages" – that is, digital geospatial information representing space/time-varying phe-nomena. This document specifies the WCS core; every implementation of a WCS shall adhere to this standard. This standard thus defines only basic requirements. Extensions to the core will define extensions to meet additional requirements, such as the response encoding. Indeed, additional extensions are required in order to completely specify a WCS for implementation. A WCS provides access to coverage data in forms that are useful for client-side rendering, as input into scientific models, and for other clients. The WCS may be compared to the OGC Web Feature Service (WFS)  and the Web Map Service (WMS) . As WMS and WFS service instances, a WCS allows clients to choose portions of a server's information holdings based on spatial constraints and other query criteria. The purpose of the WFS is to describe data manipulation operations on OGC Simple Features (feature instances) such that servers and clients can “communicate” at the feature level. WFS servers normally apply an application schema or profile of GML for the payload. WFS allows a client to retrieve and update geospatial data encoded in (GML) from multiple WFSs. It defines interfaces for data access and manipulation operations on geographic features, usually using http as the distributed computing platform. A Transactional WFS allows creation, deletion and updating of features in addition to querying and retrieval of features. The WFS Temporality Extension defines extensions to the WFS 2.0 and FES 2.0 standards to provide specific support for the management of dynamic feature data, more specifically AIXM data. The specification is based on the work of and experiences made in the Aviation threads of several OWS test beds, from OWS-7 to OWS-9. The WFS-G web service allows a client to search and retrieve elements of a geo-referenced vocabulary of well-known place-names. The WFS Gazetteer Profile is an Application profile of WFS. Published as a best practice document in 2011. It implements a more comprehensive set of elements from the “Spatial referencing by geographic identifiers” (ISO 19112) that defines an abstract model to be implemented by a gazetteer service. WMS provides a simple HTTP interface for requesting geo-registered map images from one or more distributed geospatial databases. A WMS request defines the geographic layer(s) and area of interest to be processed. The response to the request is one or more map images (returned as JPEG, PNG, etc.) that can be displayed in a browser application. WMTS offers a complementary approach to WMS by tiling maps. WMS focuses on rendering custom maps and is an ideal solution for dynamic data or custom styled maps (combined with SLD). WMTS focuses on fast serving of static data (base maps) constraining the bounding box and scales to discrete tiles. WMTS makes easier to use development strategies to improve scalability like caching, pre-rendering and clustering. XACML stands for eXtensible Access Control Markup Language. The standard defines a declarative access control policy language implemented in XML and a processing model describing how to evaluate authorization requests according to the rules defined in policies. As a published standard specification, one of the goals of XACML is to promote common terminology and interoperability between authorization implementations by multiple vendors. XACML is primarily an Attribute Based Access Control system (ABAC), where attributes (bits of data) associated with a user or action or resource are inputs into the decision of whether a given user may access a given resource in a particular way. Role-based access control (RBAC) can also be implemented in XACML as a specialization of ABAC. The XACML model supports and encourages the separation of the authorization decision from the point of use. When authorization decisions are baked into client applications (or based on local machine userids and Access Control Lists (ACLs)), it is very difficult to update the decision criteria when the governing policy changes. When the client is decoupled from the authorization decision, authorization policies can be updated on the fly and affect all clients immediately. GeoXACML defines a geospatial extension to the OASIS XACML standard, incorporating spatial data types and spatial authorization decision functions based on the OGC Simple Features and GML standards. Those data types and functions can be used to define additional spatial access constraints for XACML based policies. Essentially, GeoXACML supports the declaration and enforcement of access rights based on geographic information. As a background, XACML together with associated schemas and resource profiles, defines the syntax and semantics for access control. Beside a schema to encode policies, XACML includes a request-response context schema that includes a specification of the generic data level interface between the Policy Enforcement Point (PEP) and the XACML processor/Policy Decision Point (PDP). Since GeoXACML only defines extensions to the policy-encoding schema, it doesn’t affect the XACML request-response context schema and therefore doesn’t include an interface specification of any kind. XACML includes a model for an access control system. This incorporates stereotype definitions of a Policy Information Point (PIP), Policy Decision Point (PDP) or Authorization Service, Policy Administration Point (PAP) or License Manager, and a Policy Enforcement Point (PEP) or Gatekeeper, as well as their relations to each other in the context of an access control system. More information on how these components interact is available in the computational viewpoint.